One use and you will fall in love! Made with nourishing oils and butters — this soap will leave your skin smooth and supple…no dry feeling whatsoever. Not to mention, the addition of essential oils of peppermint, lavender, and tea tree add an all-natural antibacterial, anti-inflammatory, and anti-fungal boost. Wardeh, who runs Gnowfglins, on her personal blog Such Treasures gives the clearest, most easy to follow directions ever! This is the exact post that got me started. 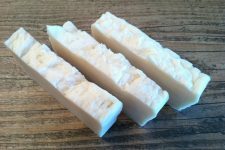 She uses the hot processed method and I highly recommend that you read her recipe if you are even the slightest bit interested in making your own soap. Renee of Fimby was also very inspirational and such a great resource! 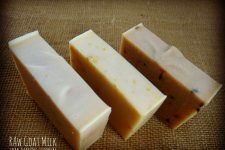 Watch her awesome video that describes the cold processed method for making a simple soap by clicking here. *Remember…there are 2 different methods for soap-making — hot and cold process — this is the Hot Process Method. Measure both the lye and water – each in separate bowls — using a kitchen scale. Note: Always run your recipe through a lye calculator to be sure that you are using the proper amount of oils, lye, and liquid. Carefully combine the lye and water by pouring the lye into the water (never pour liquid into the lye) and stir liquid until lye is completely dissolved. The liquid is caustic and not to be touched in anyway. The outside of the bowl will be extremely hot as well. Be careful when working with lye and follow all of the recommended precautions. Note: What I’m trying to say is, I can not be held responsible for any craziness, mishaps, explosions, etc. that may happen when making this recipe. Allow the lye mixture to stay under a vent and cool down while you prepare the oils. Measure the oils – by weight – and then place in a crock pot to melt on low heat. Please omit the essential oils…we’ll be adding them later. Once melted, add the lye/water mixture to the oils in the crock pot and stir. Note: Any equipment the lye touches needs to be neutralized in a mixture of white vinegar, soap, and water. After 1-2 minutes, add the pumice power. Using a wire whisk, whisk until well combined. Continue whisking for 2-3 minutes more – until the mixture becomes a thick, pudding like consistency. Once the mixture is pudding-like, cover the crock pot and “cook” the soap, on low heat, for approximately 1 hour. Prepare your mold. Note: I just use a standard loaf pan lined with parchment paper and it’s always worked perfectly and this recipe is enough to fill one loaf pan. Once the soap is done “cooking” remove from heat and quickly add the essential oils. Spoon soap mixture into molds. Allow soap to cool and harden for 24 hours. Remove from mold on to cutting board and cut into bars. Place bars on a tray with good airflow so that they can harden further. 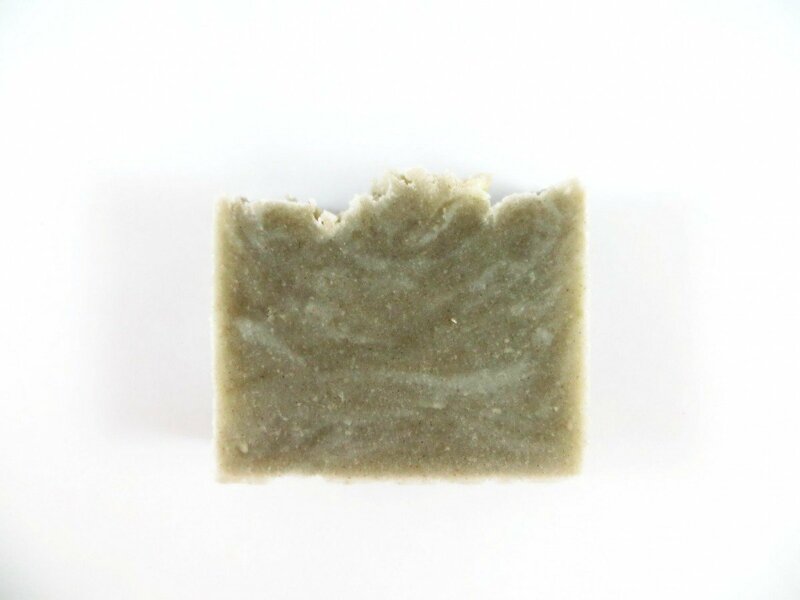 -Mountain Rose Herbs…they have everything (dried herbs and quality oils) you’ll need for this soap! It’s your one-stop-shop! -I also just love the people over at The Soap Dish. You can purchase lye and other ingredients necessary for this recipe. I thank you for your love and support of quality handmade products! And as always…if you really enjoyed this post I would be so honored if you’d click this link and subscribe to the blog! To those of you who have been committed readers, I sincerely thank you. What size mold do you use for your soaps? I’m in a soap-making class right now so just getting into this. Just curious as to what size your mold is so I can adapt my recipe or buy a similar size mold so I don’t have to adapt the recipe. Can’t wait to try this. She mentioned in the article that this recipie would fit a standard loaf pan and that is what she uses. She also said that she lines the loaf pan with parchment paper. I hope this helps!!! Do you use the same equipment to cook food later or should you have separate equipment? Seriously love that book too! Now I need to look at their recipe for pumice soap 🙂 How did you like the shampoo bar btw? I also like using corn meal as an exfoliant, it’s a tad more gentle on skin. Thank you, I looked at your site and have subscribed, it looks wonderful. Thank you Sue! I’m so happy to have you as a subscribed follower 🙂 I LOVE it!!! I would love to make this but am Vegan. What can I substitute for the tallow? Palm oil is a good sub for lard or tallow. Palm oil…but lots of vegans have issues with palm oil secondary to the way it has been harvested in the past. Look for 100% organic and sustainably sourced palm oil as suitable alternative. How long do they need to sit and cure until they are ready for use? This is a hot process soap so the lye has cooked and the soap is cured. 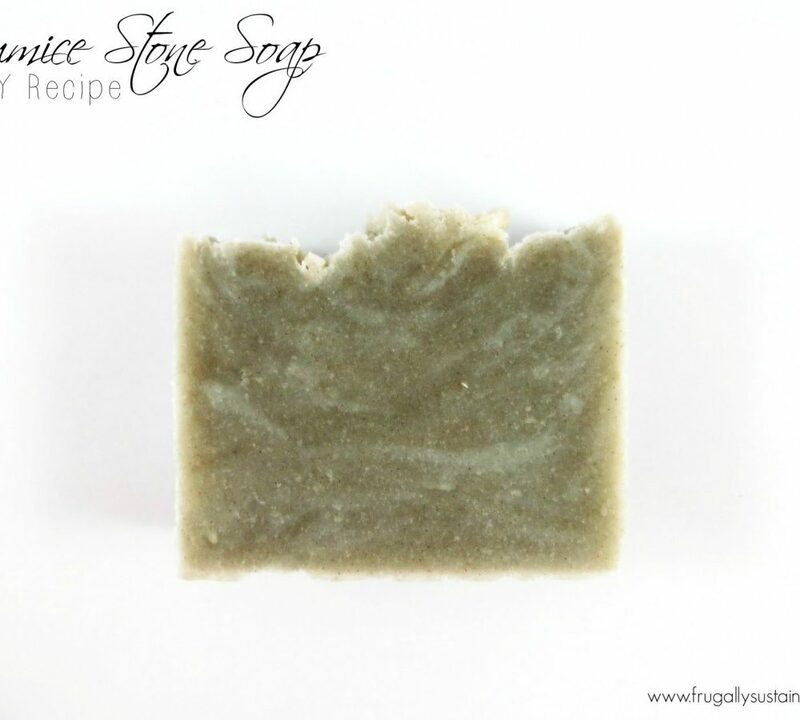 It’s safe to use as soon as it cools but for a longer lasting bar let it continue to dry for several weeks. This is a really great idea! 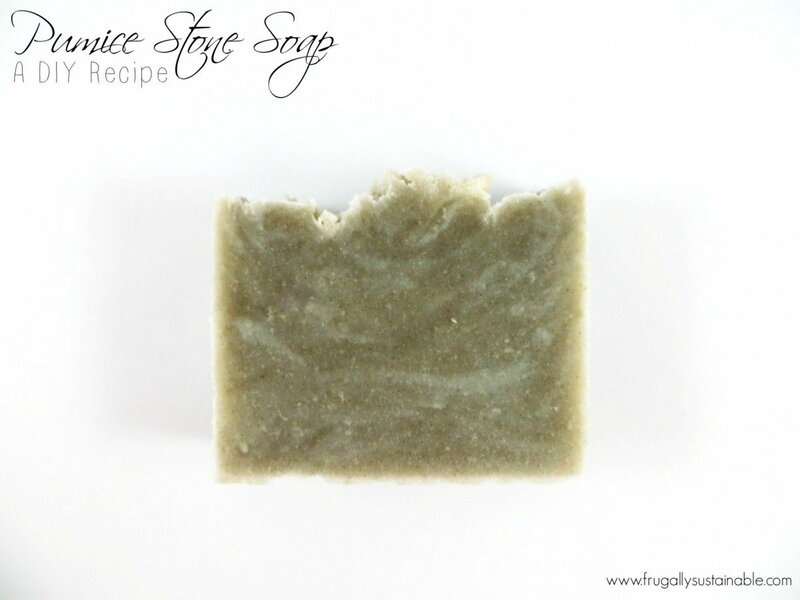 I use a pumice stone with soap all the time for my rough skin, this would be even better! When I finally get to try my hand at soap making this will be #2 on the list! Great tutorial! I haven’t used pumice in my soaps yet but I might give it a try now. I do more decorative cold-processed soaps, including cupcakes, and I have tutorials over at my website also. http://maitribathbody.com. Keep up the great tutorials! Where can I get Grass Fed Tallow?? Thank you. Ask your butcher for suet (the fat around the kidneys of the cow). Double points if he will grind it for you. If not, you’ll have to cut it into chunks and that is a big mess. Then render it in your crockpot into tallow. Do you have to use Tallow? im a little put off by the thought of meat tallow in this? Even tho i know my great grandma made her lye soap w melted dwn pig fats.. Is there a vegetable substitution i can use, OR if you must have for this to work? or no tallow at all? Id appreciate any help on this.. Im jw.. im very new to home things but have caught on slowly, and would love to make bar soap. making my own, has Endless possibilities.. BUT To be honest the thoughts of lye scares me. I have learned, making home made fabric softener, which we love. and a laundry detergent / powder that works great easy to use, actual therapeutic for me to make. ive and am trying at liquid bath wash and dabbled in some dish detergent hardened pods i made, and i now use vinegar/lemon concentrate for my rinse agent. and works great. I love it all. The laundry detergent/ fb softener alone have saved us tons of money, plus helped with mine, my daughters allergies, sinus problems. and my son has adhd, cant handle dyes, and certain ingredients well. We’ve seen a huge change in him since switching and us too. I love the crock pot idea i found on here as well. Where is good ways to start with lye/ lye calculation. and where to buy lye, and oils and such needed items frugally and cheaply enough to try and it be okay for first time mess ups? thank you. love this site.